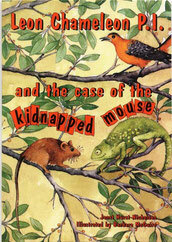 This is a rather exciting story about a woodland mouse who was kidnapped by a little boy. Mrs Woodland Mouse (the very sad wife), the local animals and Constable Mole call in the chameleon detective. Leon calls a house rat to come and gnaw through the bars of the cage that the mouse is in, but after the rat gets the mouse out a dog chases them and mouse twists his foot. This is the start of a big adventure which I enjoyed very much. At the age of nine I found the story easy to read and very funny too. My mother read it to my younger brother and laughed a lot as the author, she says, has written the book in a way that makes it funny for parents to read. (My mother doesn't like reading Noddy to us because she says it's boring for her). The story, of course, ends happily ever after, but lots of things happen on the way and the pictures are lovely. At the back is a big list of interesting facts about chameleons, mole rats, woodland mice and others and all these animals are right here where we live in South Africa. Rebecca van Zyl (9) Timeout, Daily News, Durban, July 14 1995. Leon Chameleon and his veld friends (in their 2nd adventure) all behave true to nature, so a child who enjoys the unravelling of this simple mystery is discovering (unbeknownst!) a whole lot about our smaller creatures. The illustrations by Barbara McGuire (in colour and line) help constantly, adding to character and increasing awareness. Most of us will welcome it as a darned good story. It may peak in the middle, when the Kidnapped Mouse is rescued, but the bold intervention of Spotted Eagle Owl adds a fresh new rapture (raptor?) to the tale. Janet has created these exciting detective stories which incorporate some of the little creatures living in Pigeon Valley - just below the university of Natal, Durban. These little animals come imaginatively to life and it is not long before you are transported to a world of fantasy and excitement as Leon Chameleon P.I., following in his Uncle Leonardo's footsteps, begins to unravel the mysteries that occur in the woods. Both books are enchanting and filled with delightful humour. They are highly recommended as books to invest in and add to the bookshelf along with other children's classics in the personified animal vein - i.e. The Wind in the Willows & Winnie the Pooh. If your children are being taught about conservation and protection of endangered species - these books would highlight the need for them to be more aware of the world around them - and more importantly, a world right on their doosteps. There is a section of interesting facts at the end of 'Leon Chameleon PI and the case of the kidnapped mouse' which provides valuable and little-known information on chameleons, moles, woodland mice, house rats and molerats. These two books would be wonderful gifts to purchase and send overseas to family and friends who have emigrated as the children would be able to relate to the aera as well as the local birds and animals. The books are beautifully illustrated by Barbara McGuire who captures the characteristics of each little animal and bird perfectly as well as portraying the humour that runs throughout the stories. "LEON, Leon!" cried Constable Mole, clambering out of his burrow and hurriedly dusting the soil from his fur. "Are you there, Leon?" Mole's urgent, squeaking voice startled Leon Chameleon, who was dreaming, with half-closed eyes, of all the detective cases he would one day solve. The branch he was perched on swayed slightly in the gentle breeze, and the warm sun filtering through the leaves made him feel quite sleepy. "Drat," thought Leon, as Constable Mole's frantic voice became even more urgent. "What can the little chap want in such a hurry?" Leon's eyes at the end of their cone-shaped turrets swivelled down in search of Constable Mole, whose reddish-brown body was almost invisible against the brown of the earth. At last he spotted Mole's anxious figure. "Leon!" squeaked Mole in annoyance, stamping his feet. "All right, all right. I'm coming," said Leon, sighing at Mole's impatience. Slowly Leon unfurled his tail from the twig around which he'd secured it for extra support in case he fell asleep and toppled off. He began his ponderous climb down through the branches of the Pigeonwood Tree, which was his headquarters where he waited for clients who needed his help. On reaching the lowest branch he yelled a warning: "Watch out, Mole!" "Oh no," muttered Mole when he heard Leon drawing in great puffs of air. He knew from past experience that it wasn't safe under trees when Leon was about to launch himself from a branch. He scurried down his hole out of harm's way.